“Go ahead make my day” is one of many iconic phrases from Clint Eastwood in "Sudden Impact." If you love the untamed Wild West, cowboys, and adventure, then you need to go to Moab, Utah. Over 40 movies and television series have used the red Moab cliffs for background shots, like "MacGyver," "Thelma and Louise," "Mission Impossible II," and "127 Hours," just to name a few, all filmed in Moab. Plan a trip to visit some of your favorite movie locations to act out a scene or two, just don’t drive off a cliff like "Thelma and Louise." From horseback riding, hiking, and scenic flights there’s plenty to do to live out your cowboy vacation. 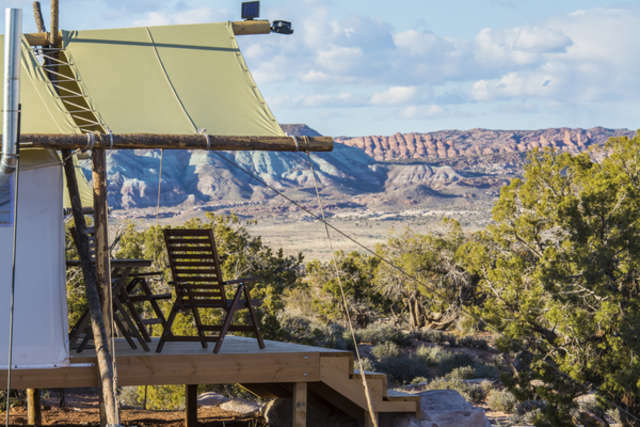 7 miles north of Moab, Utah lies a camping resort that's a cut above the rest. Nestled amongst canyons, plateaus, and panoramic views that will leave you in awe, Moab Under Canvas is 40 acres of pristine natural beauty. It's minutes away from Arches National Park and Canyonlands National Park. Booking starts at just $89. If you're in the mood for the ultimate "glamping" experience, then the Safari tent is what you're looking for. Each tent sleeps two adults and two children. However, if you're going to bring your kids, I'd recommend you and the missus take the Safari tent, and the kids can stay in a tipi tent right next to you. Up to four kids can fit in the tipi tents. Worried about bathroom facilities? Well, that's nonsense! Moab Under Canvas has luxury bathrooms complete with showers, toilets, sinks...and spa products! The Safari tents also come with a wood burning stove and firewood. If you're more of a budget-conscious adventurer, then the Tipi tents are perfect. Up to four people can fit in one, and the tents come with cots, mattress padding, sleeping bags, pillows, towels, chairs, a table and lantern. So, you just have to show up! Dead Horse Point State Park stands 2,000 feet above the Colorado River offering views of southeastern Utah and the Canyonlands National Park. As legend has it Dead Horse Point was used as a natural corral for cowboys to round up wild mustangs. This should be a definite to-do for anyone planning a trip to Moab. Calling all adrenaline junkies! Canyonlands National Park is known for its Native American ruins and the darkest night skies in North America. Though, if you need a little more than spooky Native American folk tales and complete darkness to make your pupils dilate then keep reading! Canyonlands National Park is full of adrenaline-pumping fun like extreme climbs, rugged canyon trails and wild rapids. We’ve got enough adrenaline jolting adventures to tide you over for months…who are we kidding? You’ll have such a wild time you won’t be able to stay away that long! The Mesa Arch is not only an amazing natural wonder but also a jaw-dropping hike, one wrong step and you could be head-over-hiking boots down the canyon side. If your heart is still not thumping out of your chest, then take a look at this sandstone summit spire off the La Sal Mountains. Also known as Island in the Sky, these sandstone towers in Canyonlands National Park attract high-risk climbers from all over and it’s obvious why! Just thinking about this climb makes my skin prickle. If you’ve ever wanted to pretend you were in one of those Ford truck commercials, scaling the side of a canyon White Rim Road is the perfect place! This road calls for high clearance vehicles, which sounds a little like there should be a flashing neon sign that says “DANGER”. Even with the suggestion of high clearance vehicles some people opt to bike! Ride the epinephrine wave going on in your system and channel it into the next extreme sport- white water rafting! Rafting in Cataract Canyon is no joke. The Colorado River and Green River’s paths meet in Cataract Canyon where their currents run into each other, combining their forces to create wild rapids!